The most common request we’ve received since launching LayoutPress is being able to try it before buying it. To answer this request, today we are releasing a free version called LayoutPress Lite. This version is currently pending review for submission into the WordPress Theme Directory but in the meantime, we are making it available free to download here. It can also be dowloaded on the homepage by clicking the Try Now button. Install WordPress (if not already installed). On the Themes page, click Add New. On the Add Themes page, click Upload Theme. 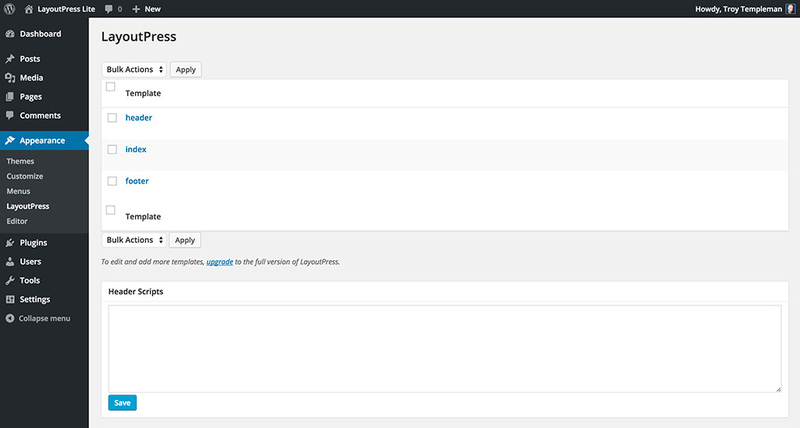 On the Add Themes page, click Choose File to locate the LayoutPress .zip file. Click Open. Click Install Now. On the Installing Theme from uploaded file page, click Activate. To start using LayoutPress, go to Appearance > LayoutPress. LayoutPress Lite will give you an excellent idea of how the full version of LayoutPress works. The only limitation when compared to the full version is that you can only edit three templates – header, index and footer. However, if you want your website to have the same layout throughout, LayoutPress Lite is all you need! The Drag and Drop Page Layout Editor is exactly the same as in the full version. This lets you easily create a grid system by adding rows and columns and dragging native WordPress widgets into desired position. To learn more about editing templates, click here. We are happy to let you try LayoutPress with this version and if you enjoy it as much as we do, we encourage you to upgrade to the full version to receive extra features.